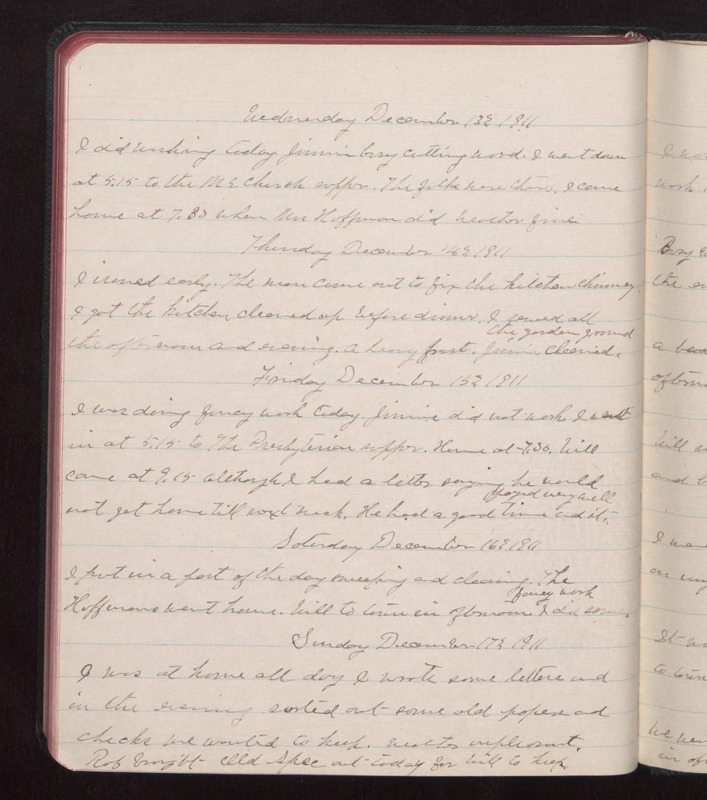 Wednesday December 13 1911 I did washing today Jimmie busy cutting wood. I went down at 5.15 to the ME Church supper. The folks were there. I came home at 7.30 when Mrs. Hoffman did Weather fine. Thursday December 14 1911 I ironed early. The man came out to fix the kitchen chimney. I got the kitchen cleaned up before dinner. I sewed all the afternoon and evening. A [hoary?] frost. Jimmie cleaned the garden ground Friday December 15 1911 I was doing fancy work today. Jimmie did not work I went in at 5.15 to The Presbyterian supper. Home at 7.30. Will came at 9.15 although I had a letter saying he would not get home till next week. He had a good time and it payed very well. Saturday December 16 1911 I put in a part of the day sweeping and cleaning. The Hoffmans went home. Will to town in afternoon. I did some fancy work Sunday December 17 1911 I was at home all day I wrote some letters and in the evening sorted out some old papers and chicks we wanted to keep. Weather unpleasant. Rob brought [illegible] Spec out today for Will to keep.